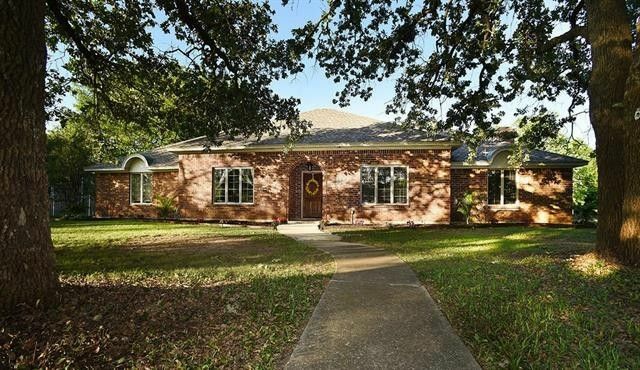 Remarkable one-story brick home on half acre corner lot boasts hardwood floors throughout most of the home except tiled areas. Four private oversized bedrooms with 4 full bathrooms offer convenience for all! The large family room with slate fireplace opens to the breakfastrm & kitchen. Just off the large study-office (once formal living room) the gameroom (once formal dining room) is big enough for a pool table & TV area. The chef's kitchen has a slate arch over the gas cooktop, & freshly painted cabinets & walls that are Better Homes & Gardens gorgeous with an huge island & room for bar stools! Master suite has jettub, shower,2 walkin closets, double vanities, door to WOW POOL& SPA,PERGOLA, PATIOS, FIREPLACE! Directions: Take Teasley Ln south off of I-35 E to Hobson Ln. Turn right onto Hobson Ln. Turn left onto Montecito Dr. Home is on the corner of Montecito and Granada Trail. Go to side entry door next to garages.